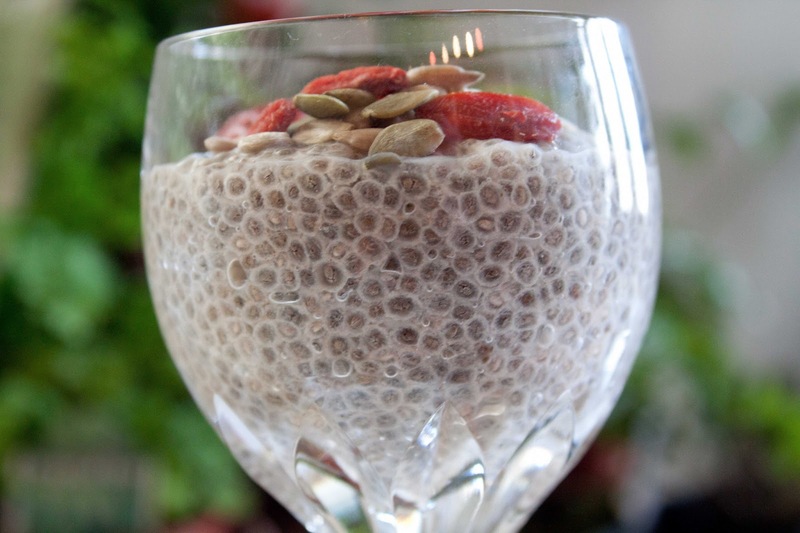 If you haven't heard, chia seeds aren't just for pets anymore. Rich in Omega-3's, fiber, protein, calcium, potassium, phosphorus, magnesium, manganese, copper, iron, niacin, and zinc, and the seeds help to regulate blood sugar....basically it's the superfood of super foods. Chia seeds are similar to tapioca ball, just smaller. They don't really have a flavor, except for maybe leaning on the nutty side, so I like to think of them as a vessel to carry other flavors while delivery a super healthy and filling punch. So the question then is what to do with these power-packed seeds? 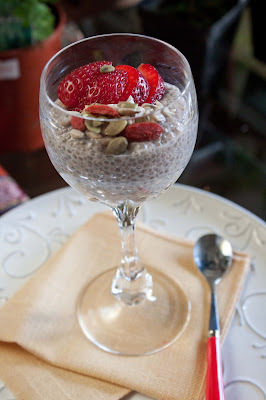 How about a real simple, healthy treat that can be breakfast or a snack? For this recipe I made my own coconut milk. You can use store bought, but you might be shocked at how easy it is to make (5 minutes), not to mention it's cheaper and free of the extra sugar and preservative that can be found in a store brand versions. Pets aside, put some chia seeds into your diet for a Fat and Happy nutritional boost. Fat and Happy Food Blog Tips and Techniques: Substitute your preferred milk for the homemade coconut milk. If you are making your own milk, start here: Heat the water to just below boiling. Place the coconut flakes and hot water in the blender, blend on high for 3 minutes (I use a Blendtec blender, you may need to blend a bit longer if your blender isn't quite as powerful). Strain the milk using a fine mesh strainer set over a glass bowl, pushing on the coconut to remove all the liquid or use a cheese cloth, twisting to remove all the remaining milk out of the coconut. Discard the coconut or lay out to dry for use in other baking recipes. If you are using prepared or store bought milk, start here: To the coconut milk whisk in the cinnamon, maple syrup, vanilla and chia seeds.. Cover and set in the refrigerator for at least 2 hours or overnight. Serve with the mixed seeds and sliced berries..